In the early 2000s, Lotus (the world’s pluckiest car company) built a turbocharged mid-engine convertible for General Motors (the world’s least plucky car company) called the Speedster. The problem is now nobody can exactly agree why. So we talked to Lotus and got to the bottom of it. 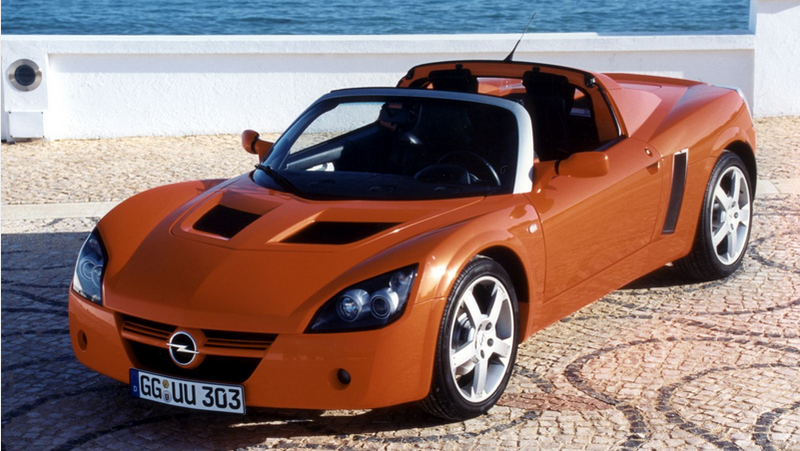 The story of the Opel Speedster, as it is written all over the internet, started in the late 1990s. Lotus had found itself in a bit of a bind, as its breakout success Elise wasn’t going to meet model-year 2000 European crash tests and the company needed financial help to design a new Elise Series II platform that could. So Lotus’s former owner GM stepped in and provided the cash, but as payment, Lotus had to modify the new platform to build a sports car for The General in Europe. Thus, the Speedster was born. The Elise’s popularity was spotted by G.M., which was looking for an eye-catching model to spice up its stodgy image in Europe. G.M. commissioned Lotus to transform the Elise into the Opel Speedster, a new model that went into production...alongside the Elise. We’ve worked with [GM] before and in effect they wanted a piece of Lotus...They can’t understand why people buy Lotuses, but they realised it was exactly what their brand needed. They needed a sports car, for Germany especially, to [give] the brand some hype. So the two polar-opposite companies struck a deal, and between 2000 and 2005, Lotus built GM’s little sports car alongside the Elise in the company’s new Hethel, Norfolk, England plant. But that’s not the end of it. There’s more conflict on the history of the Speedster than just which company approached the other and why the cars came about. There’s also a lot of competing information on which car, the Speedster or the Elise Series II, was based on the other. Unlike the Elise S1, GM wanted what would become the Opel Speedster/Vauxhall VX220 to have easier ingress and egress, more safety equipment, and a GM powertrain. In response, the chassis side rails were lowered, front air bags and ABS were fitted, GM’s L850 Ecotec engine replaced the Rover unit, and a new assembly plant was erected. I have spoken to the person in the know and this is how it happened. Lotus had always planned on a Series 2 Elise and when GM approached Lotus to work with them to do a sports car, it was the natural thing to do the two programmes in parallel. Neither car was based on the other and around 8% of the parts were shared but of course the technology and the build process under the skin was similar and some of the suppliers (Bridgestone for example at the time were shared and both cars had cut-down sills). The VX220 / Speedster was built on a different line to the Elise and Exige, the Esprit was on a separate line as well at Hethel. So it looks like the real story, at least according to Lotus, is that the Speedster came about not because Opel needed financial help from GM to meet safety standards, but because GM approached Lotus for a sports car. And neither car was based on the other; Lotus already had the Series II in the cards, so it decided to develop the two programs in parallel, with each car being markedly different from the other, even though they were built using similar methods. Despite the differences, both cars were masterpieces. According to Speedster.com, a site devoted to GM’s little roadster, the Speedster’s chassis is comprised of a lightweight aluminum tub reinforced by fiberglass, bringing the curb weight to an almost gravity-defying 1,918 pounds. That weight figure applies to the version powered by GM’s 148 horsepower 2.2-liter Ecotec inline-four, the same engine you might find in a Saturn Vue, Saturn Ion or Chevy Cobalt of the era. But it gets better. Three years later for the 2003 model year, GM released a 2.0-liter turbocharged model putting out 200 horsepower, and still weighing less than any Miata at only 2,050 pounds. And that turned out to be correct. Successful as the Elise was, the Speedster was a flop, missing its sales targets by a wide margin. If there was any debate as to why GM set up the production of their turbo-Elise in the first place, it’s certainly clear why it let the thing die. Still, for those of us looking for a new fun vehicle, just know that running around Europe are about 8,000 manual-transmission, mid-engine, rear-wheel drive, targa-topped sports cars, some of which are turbo and all of which weigh less than an NA Miata. 2025 can’t come soon enough. Please Read More About This Car That David Loves - Ed.